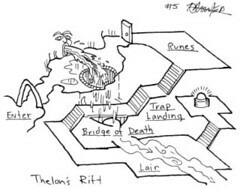 "Through the cascade and across the Bridge of Death" lies Thelon's Rift, greatest treasure of..."
That's all the old fragment reads. Nevertheless, when you throw in the map, it's more than enough to excite a dungeon delver's heart. The map shows the entrance is barely a day's march from Streiveport. As for the nature of the Thelon's Rift and identity of the treasure holder, who knows? I really dig this one. Good job! Sweet, I like this one a lot ! I'm a bit confused about the "trap landing" thing. Where is the trap and where do you land ?